HE Minister of Energy and Industry Dr. Mohammed bin Saleh Al Sada has left for the Austrian capital, Vienna, to attend the 168th meeting of the Organization of Petroleum Exporting Countries (OPEC) which will be held at the Organization General Secretariat headquarters . A press release issued by the Ministry of Energy and Industry today said HE the Minister is accompanied by a delegation of senior officials of the energy sector in Qatar. It is to be noted that the State of Qatar is holding this year, the post of acting president of OPEC, and will chair the Organization throughout 2016. 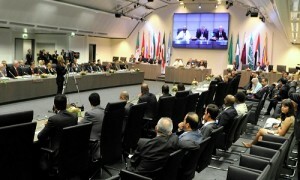 The meeting is held in light of the decrease in oil prices due to increased production, and increase the strength of the dollar, with expectations of higher interest rates, as well as expectations of the World Bank and the IMF, of low economic growth at a rate between 3 percent and 3.2 percent, and the rising of global oil reserves to three billion barrels, according to the International Energy Agency estimates. It is expected that the decline in investment in the energy sector, and in the exploration around the world would result in reducing the production of OPEC non-member States in oil operations over the next year, which will help restore balance to the global market.